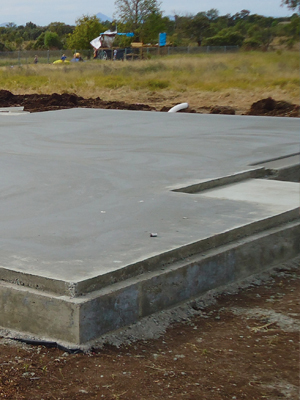 Concrete house slabs are built on the building site using formwork – a type of boxing into which the wet concrete is poured. 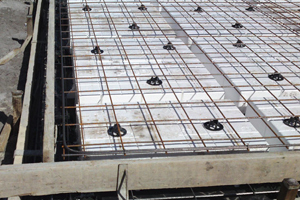 If the slab is to be reinforced, the rebars are positioned within the formwork before the concrete is poured in. Plastic cup spacers are used to hold the rebar away from the bottom and sides of the form-work, so that when the concrete sets it completely envelops the reinforcement. 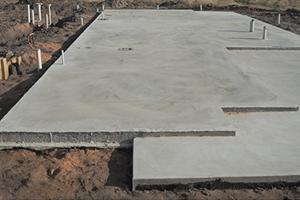 For a ground slab, the form-work may consist only of sidewalls pushed into the ground. For a suspended slab, the form-work is shaped like a tray, often supported by a temporary scaffold until the concrete sets. 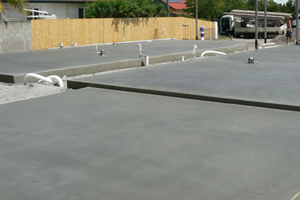 At Hume & Sons Concreting we can pour conventional house slabs or waffle house slabs. There is only one advantage of waffle pod slab construction – reduced cost. The waffle pod slab is no more than a slab of concrete placed on the ground, with polystyrene blocks in a grid pattern within. This results in a system consisting of a slab with a grid of stiffening and edge beams, giving the (reverse) effect of a ‘waffle’ if viewed from underneath. Some engineers argue that the waffle pod slab is stronger due to less shrinkage stresses and fewer cracks in a waffle slab but a conventional slab is less likely to crack if it is overloaded. GET THE JOB DONE RIGHT FIRST TIME! CONTACT US TODAY FOR A QUOTE ON A HOUSE SLAB!